Shalom Ba'adani, grandson of Shas sage, laid to rest; at the funeral, Sephardic Chief Rabbi calls for Jews to stop ascending Temple Mount. Shalom Ba'adani, hy"d, the 17-year-old teen who was fatally wounded in Wednesday's rampage in Jerusalem, has been laid to rest in Jerusalem's Har Hamenuhot cemetery on Friday morning shortly after he passed away. Ba'adani is the grandson of a member of the Council of Torah Sages of the Shas party, Rabbi Shimon Ba'adani. Jerusalem Mayor Nir Barkat, Knesset members of the Shas and United Torah Judaism parties, and Rishon Lezion and Sephardic Chief Rabbi Yitzhak Yosef attended the funeral. 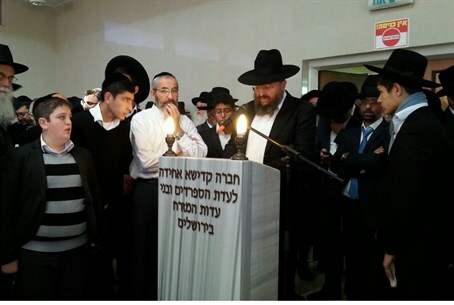 Rabbi Yosef eulogized Shalom, calling for Jews to stop ascending to the holiest site in Judaism, the Temple Mount - as terror groups have been calling for - as a means of stopping more terror attacks. "Stop inciting the people of Esau," Rav Yosef said. "It is causing unrest among the Arabs, for them to hate us, and is adding fuel to the fire." And terror groups have been justifying attacks by claiming that the desire for equal prayer rights for Jews on the Mount "causes" the attacks - including Wednesday's. On Wednesday, a car terror attack in Jerusalem killed a Border Patrol officer, and injured 13 others. One of the wounded remains in critical condition, and several others are still wounded. The Hamas terrorist, Ibrahim Al-Akari, a resident of Shuafat in eastern Jerusalem, ran over a group of pedestrians, continued driving and struck another vehicle traveling along the road. He hit another vehicle before being stopped. Al-Akari descended from the vehicle with a crowbar and began attacking passers-by. Police and Border Patrol officers shot him and killed him. It was the third large-scale terror attack in a two-week period, after both a similar attack which killed a three month-old baby and a seminary student and the attempted murder of Temple Mount rights activist Yehuda Glick; since then several other attacks have occurred.